We are sending a shout out to Quadrato for opening at the Junction. The WSJA staff dropped by to welcome them to the Junction and we had some delicious veggie sandwiches. It came with mac salad that totally balanced out the lovely richness of the sandwich. Cary Kemp, owner of Quadrato, excitedly told us that we were the 2nd and 3rd customers since they opened this morning. 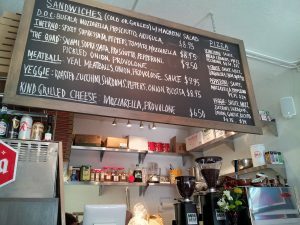 Aside from sandwiches they are also serving, pizza by the slice, salads and some good coffee. Let’s welcome them to the West Seattle Junction! 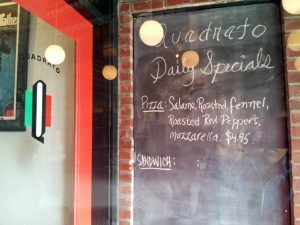 Quadrato is located at the West Seattle Junction, at 4302 SW Oregon Street.